Ronda is situated in a mountainous area, about 750 meters above sea level, in the northwest of the province of Málaga and about 100 Km from Málaga capital. 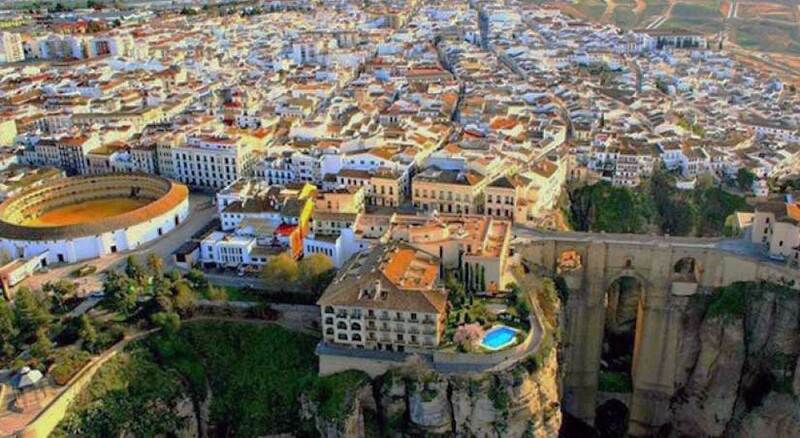 The city of Ronda is assented on a rocky plateau of volcanic origin and on the edge of a 120 meters deep canyon. The river Guadalevín is running through the gorge and divides the city in two. There are two bridges, the Puente Viejo and the Puente Nuevo, which spans 100 meters above the gorge, known as the Tajo de Ronda. East to the city is situated the natural Park Sierra de las Nieves Mountain range, in the south lies the river valley of the Genal and west we find again mountain ranges of the Sierra de Grazalema. Ronda can be accessed by the motorways from Málaga, Algeciras, Granada, Córdoba and Madrid. There are as well train connections from these cities. Regional Buses to Ronda leave from all mayor tourist resorts along the Costa del Sol such as Málaga, Torremolinos, Benalmádena, Fuengirola, Marbella y San Pedro de Alcántara.